I am still going through a healing crisis. I talked to Dr. Fielder yesterday, and he reminded me that I need to fast. I am taking his advice and fasting for a few days. I am not going to talk about the fast much on here as it is not wise to do so. When I was staying at the Clohesy River Health Farm back in 2011, I did a fast and blogged about it every day. A friend then began to send me messages that I was doing the wrong thing....it was quite dangerous...I was going to die. It ended up that Dr. Fielder decided that I should end the fast since those thought were prevalent in my mind. Then he reminded me that the Bible says that when you fast you tell no one. He said you can talk about it when it is over, but not when you are in it. Fasting is as much mental and spiritual as it is physical. We get our water from the hot springs in Hot Springs, Arkansas. We have about 20 gallon bottles that we take into town and fill up with the hot water as we need to. This water is high in mineral content so may not be ideal, but we feel like it our best option for pure water. It should be consumed before the "best by" date printed on the packaging. Bisphenol-A (BPA) is not present in our bottled water packaging smaller than three gallons. Our single-serve bottles (typically 1.5 liters and smaller) are made from PET plastic (marked with the "1" symbol), which is flexible and lightweight. 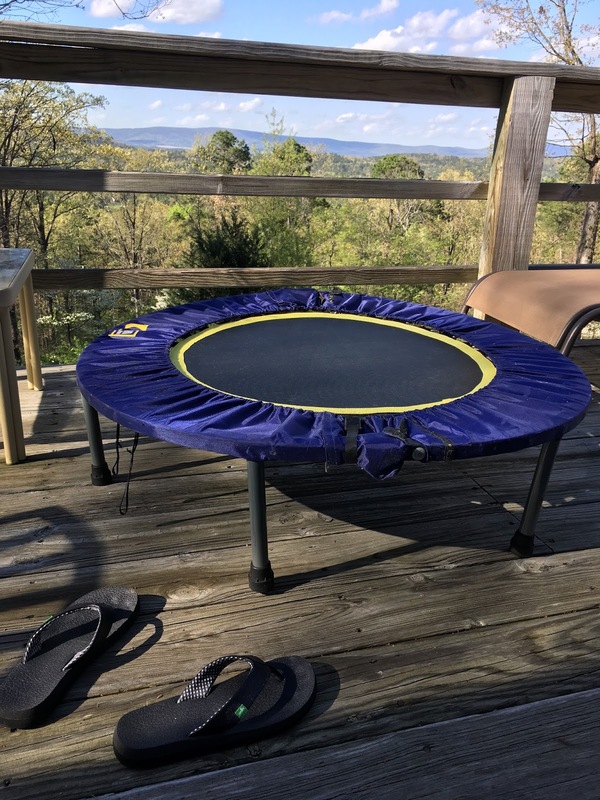 Travis moved my rebounder to the upper deck because it is many times more beneficial to exercise outside than inside. 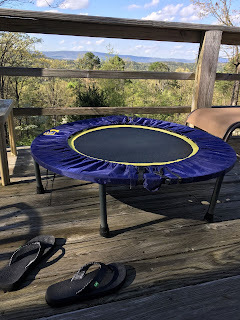 Rebounding is good for energizing the lymph, and the lymph in turn detoxes the body. Imagine how much less it would cost to run the world if everyone was healthy. It's mind-boggling. In 2015, people in the United States alone spent $3.2 trillion on health care that did very little to actually make them healthy. That's not even counting the suffering that accompanied that care. We are all for emergency care to save lives, but there is a better way to heal from acute and chronic sicknesses that cost a tiny fraction of what is now being spent. We can improve our health in a short period of time simply by cutting out processed foods, sugar, alcohol, and fat. Some of us have experienced those changes for ourselves, and these changes are measurable. My own blood tests every year show normal ranges and no deficiencies. I take no medications. It seems like most people and even most doctors don't really understand what a healthy diet is....although, happily, more and more people are becoming aware. But there is still work to be done because people are still experiencing deficiencies and malnutrition. According to Keki Sidwha, whose book The Quintessence of Natural Living inspires me daily, the human body has 50,000 to 100,000 different chemicals that go into its making and running. They interact with one another in complex ways that make our high technology look rudimentary. Nature has constructed the human body in such a way that the body is able to function efficiently only by synergistic cooperation of the nutrients derived from natural sources. A diet that deviates from what the body was genetically programmed to expect leads to progressive malnutrition. First there is deprivation at the cellular level, then gradual failure of the immune system, then sickness. I will not make the lemon ginger blast again. Neither Travis nor I really wanted it, so we will go back to our regular veggie cocktail which is usually carrots, beets, celery and apple. Sometimes with cilantro or parsley added. Much love to everyone and hope you have a lovely day. The Right Amount of Tension Produces Music!